Have you been looking for a car that has the same desire to get on the road and take a great drive that you’ve got? If so, the 2018 model of the Toyota 86 can be the perfect choice for you. This is a small, lightweight coupe that’s affordable and active on the road. This car has the balance you’re looking for and won’t require you to learn how to drive on a track to enjoy what it offers you when you’re ready to get out and take a drive. This is a quick and active model that looks great and offers the personality you desire. If you love to drive, the Toyota 86 is the car for you. This RWD sports car is one that will let you have the fun you’re looking for with the steering system that makes it easy to drift it around corners and rip off some speed on the open road. Check out this little performance car that can be ideal for you to have what you want when it’s time to enjoy the road that you’ve decided needs to be tackled and mastered by you and your Toyota 86. Last year, the Toyota 86 received a long list of updates and improvements to make it the exciting little car you see today. For the 2018 model year, the upgrades are few, but they are significant. You can choose a new GT trim level with leather upholstery and the top of the trim tree is now called the 86 Black. Both of these trims are offered with either a six-speed manual or automatic transmission to make sure you have the drive you want and the performance you need in a car that looks as amazing as it is to drive. One reason the Toyota 86 is so easy to buy is the fact that it offers you only a few choices for the items you can enjoy. This philosophy is a carry-over from the Scion days when this was the FR-S. The base model of the 86 shows up with air conditioning, cruise control, a power package, 17-inch alloy wheels, Bluetooth connectivity, a touchscreen audio system, a rearview camera, and USB ports. The GT and Black trim levels add dual-zone climate controls, push-button starting, and a display with a g-meter to make sure you have the exciting qualities you want to enjoy. The options you can choose when you’re ready to have the drive you want include a choice of colors, an upgraded audio system with a navigation system included, some exterior improvements for the GT trim, LED fog lights, blacked out mirrors and rear wing supports, and a package of TRD performance gear that includes lowering springs, a quick shift kit, anti-roll bars, larger wheels, and much more. Take a look at the variety of items you can add to the Toyota 86 and make this the right choice for your driving pleasure. The Toyota 86 that makes use of the six-speed automatic transmission allows you to have 200 horsepower and 151 lb.-ft. of torque from under the hood to give you the driving experience you’re looking for. If you want to experience driving excitement and a quality feeling when you head out on the road, you need to take a look at the 2018 version of the Toyota 86. This incredible small sports car can give you the performance you want and the ride that makes a difference to you when you take it for a test drive from your nearby Toyota dealership. This is a car that puts a smile on your face and allows you to have a drive you can enjoy every day. 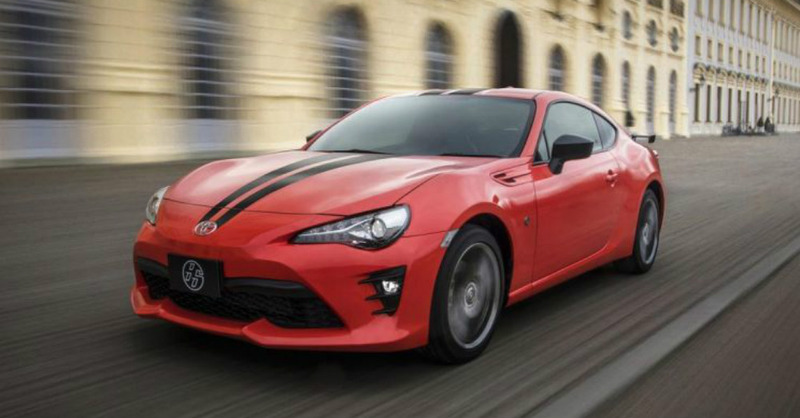 As an affordable choice, you can make, the Toyota 86 will be the car you love to drive.